Steve Sells – the man behind Naim’s electronics | What Hi-Fi? We talk to the man behind Naim's electronics about everything from tape decks to Class D amps, designing the Naim Statement and what's on his home hi-fi system. Steve Sells is Naim Audio’s electronic design director. 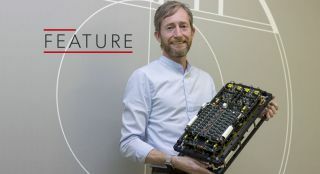 He’s responsible for the development of the company’s range of highly-rated electronics, from those used in wireless speakers such as the Mu-so all the way through to the £170,000 Statement pre/power combination. We visited the company’s Salisbury offices to find out more about how the design process works and the man behind the sound. What Hi-Fi? : What made you interested in hi-fi? Steve Sells: I must have been about seven years old when my grandfather bought a Quadraphonic hi-fi. I remember him listening to a recording of the Philharmonic Orchestra at full volume and talking about being transported to the Albert Hall (where the recording was made). That’s when I realised that hi-fi could have such a connection with people. I was told not to touch the hi-fi because it was expensive, so I grew up with a sort of reverence to it. At around 11 years old I was given a big loudspeaker. I took it apart and couldn’t believe how simple it was, so I decided to have a go at making one myself. I went to the garden shed, found a nail, some wire, a magnet and a Cornflakes box and taped it all together. Once it was finished I plugged it into my clock radio to test it. For the next few weeks, I made speaker after speaker. WHF: Did the speakers work? SS: They gave an output! Sounded absolutely atrocious, though. SS: At around 14 or 15 I started making amplifiers. I was fortunate to live in a town with an electronics components supplier. His name was J.R. Hartley (yes, really) and he used to do mail order electronics. I bought loads of bits and built loads of things. He was an inspirational guy for me. When I was about 16 years old my brother got into hi-fi. He bought a system made up of a Dual CS-505 turntable, Rotel RA-820B amplifier (the one without tone controls) and KEF Coda speakers. I could not believe this thing. It went louder and sounded more realistic than anything else I had heard to that point. That was it. That was the point in my life when I decided I wanted to design hi-fi. WHF: What was your first job in hi-fi? SS: In my gap year at university I got a job at Cambridge Audio. It was the time of the CD1, a big multi-box CD player that had an error counter. I learnt a lot about designing products and getting them into production. I’d be building prototypes and designing circuit boards. My final year project was making a digital-to-analogue converter. I used multiple Philips TDA-1541 DACs - I think I had four of them - and a Philips 7220 digital filter, and it did 16x oversampling. WHF: What's your favourite product you've designed? SS: Naim Statement pre/power amp – I had waited all my working life to design something like this. As an audio designer you grow up wanting to make a 'no compromise' amp. Over time I had worked for Cambridge Audio, NAD, Cyrus, Roksan and Quad, and never really had the chance to design something like this. It’s only when I started at Naim that there was really a chance to do it. WHF: Was the Statement a clean sheet design? SS: It was almost too clean. When you have constraints it focuses you. When someone says it doesn’t matter how much it costs, what it looks like or how long it takes, you start to ask yourself fundamental questions about amplifier design and electronic circuitry. Those questions took a long time to get over. After a while the thing starts to take shape, and in the case of the Statement that comes from the engineering - the cooling requirements, two boxes to isolate the power supplies, the zero feedback to get the sonic speed. All these things end up dictating the final design. WHF: What qualities make Naim products different? SS: I think it’s the musicality. It’s something where you drift off into the performance. You listen to some products and you get that precise imaging and lots of detail, and that can be quite enticing. But I think for the long-term appeal of a component it needs to convey the emotion. That’s the main thing we listen for. SS: As an engineer it’s really hard to sacrifice specs, but we do it all the time. Generally, we’ll design on the bench from experience. We know what sounded good in the past so we’ll try those things again. Then when we’ve got a couple of different prototypes we’ll engineer those till they measure well. Then we go to the listening room and we play around with components to fine-tune the sound. Invariably, when you go back and measure things they’ve got worse. WHF: Do you think Class D circuitry works for high-end products? SS: I don’t think you’ll see a high-end Naim product using Class D technology for a very long time, unless changes in legislation forces us to do it. Class D delivers pretty much everything of what most people want in most applications. I really like the power, and it’s great for keeping it lightweight and efficient. You don’t need such big power supplies and heatsinks, so it’s possible to make really compact designs. But its benefits carry less weight when it comes to high-end products where performance is all. WHF: What's your favourite non-Naim product? SS: The next bit of hi-fi I want to buy is a Revox A77 reel-to-reel tape player. I’m renovating one for a friend and now I really want one. I love tape decks. Tape is fantastic. Naim did toy with making a tape deck years ago. It was before my time so I haven’t seen the prototypes. WHF: What kind of music do you listen to? SS: Mainly electronic. I’m really into Sohn at the moment. WHF: What was the first piece of music you bought? SS: It was Ian Dury and the Blockheads - Hit Me with Your Rhythm Stick on 7in vinyl. My first CD was The Dark Side of the Moon. WHF: What system do you have at home? SS: It’s always changing. It tends to be what we’re designing. So I’m just about to get an NDX 2 streamer and NAC-252 preamp. Right now I’m running a NAC-N 272 streamer/preamp and NAP 250 DR power amp with Naim SBL speakers and two subs. WHF: What sonic qualities would your perfect hi-fi product have? SS: Pace, rhythm and timing – if you can sit down, press play and you don’t feel the need to skip, then that’s just fantastic. That’s the difference between a really good hi-fi and the others. When I was younger it was all about detail and bass. I still like bass, though.